Now that you’ve found and purchased your perfect camera or camcorder, it’s important to have the right accessories to help Unlock the potential of your camera or camcorder with the right accessories. Whether you’ve invested in a new smartphone or DSLR camera, photography accessories will let you make the most of your device. Perfect for those embarking on a new hobby or upgrading their kit, photography equipment ranges from lenses and flashguns for your DSLR or compact system camera, to batteries and memory cards for your digital compact camera or camcorder. Our wide range of photography accessories can expand the capabilities of your camera, add the power or memory it needs, or deliver stylish protection. Protect your investment with the perfect camera bag or case and minimise the risk of damage. 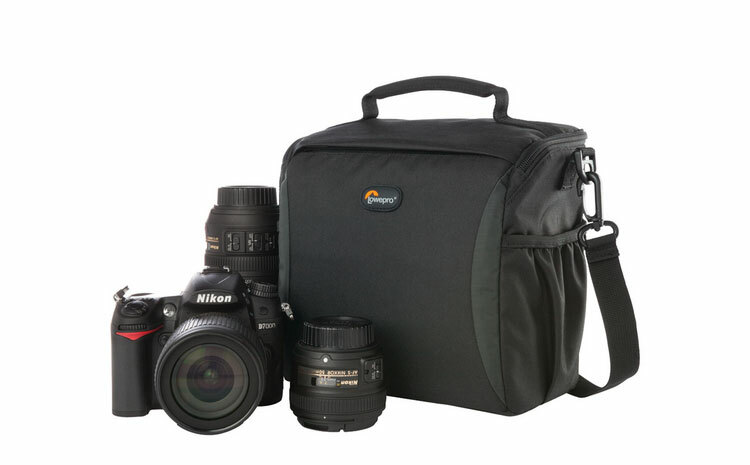 Camera bags make it easier to transport your kit and come in all shapes, sizes, colours and styles. Find the right one to suit you and your camera, whether you need a large backpack for your DSLR kit, or a smaller case for a compact camera. Give your camera a new focal length by investing in the perfect lens. Offering a wide range of creative possibilities, having a range of lenses adds versatility to your kit. Each lens is compatible with a specific camera mount, and some have useful features such as image stabilisation to counteract camera shake or silent focusing. Get a great view of faraway subjects, such as birds and other wildlife, or sports such as racing with a pair of binoculars. Ideal for hobbyists and sports fans, binoculars come in a range of sizes, from pocket-friendly compact designs to full-size binoculars with features like anti-fogging, fully coated optics and rubber armour. A telescope gives you a clear view into space from your home or garden. A powerful telescope gives a sharp view of our fascinating galaxy, while a portable telescope can be taken away from the city lights for a clearer view. Shoot portraits in low light with the help of a flashgun, which offers an increased range over most built-in camera flashes. Check your camera has a hot shoe adapter or slave master for use with a compatible flashgun and enjoy well exposed images. Keep your shots steady and level with the aid of a tripod or monopod. Whether you’re working in the studio or out in the field, a tripod is an essential when shooting images or video. Tripods come in various sizes to accommodate different cameras, from small, flexible tripods for compact cameras to heavyweight tripods for holding a DSLR. It’s easy to forget to frame our snaps in this digital age - a digital photo frame makes it easy to display your favourite photographs and switch them out when you like. Adding an interesting focal point in any room, a digital photo frame lets you create a visual slideshow of your photographic memories and also makes an ideal gift idea. An essential part of any photographer’s kit, a spare battery or two will ensure you can carry on shooting if you run out of power. We offer standard alkaline batteries for cameras and other devices as well as specialist battery packs. A great alternative to using disposable batteries, investing in a battery charger may work out cheaper in the long run and is kinder to the environment. Memory cards come in a variety of formats and sizes, so be sure to choose the right one for your camera. It’s important to consider how many images or hours of footage you want to capture as well as how fast you need your memory card to be. A memory card reader makes it easy to transfer your images to your PC. We provide a range of camcorder media for traditional camcorders models, from DVDs for high quality recording that can be conveniently played back in most disc players, to MiniDV tapes for great value and long recording times. Optimise your home movies with the best quality camcorder media for your traditional camcorder. Discover camera accessories that will enhance your photographs and movies – from smartphone selfie sticks and instant camera film, to DSLR filters and remotes. We stock a wide range of stylish and handy accessories to suit all types of cameras and all kinds of budgets.